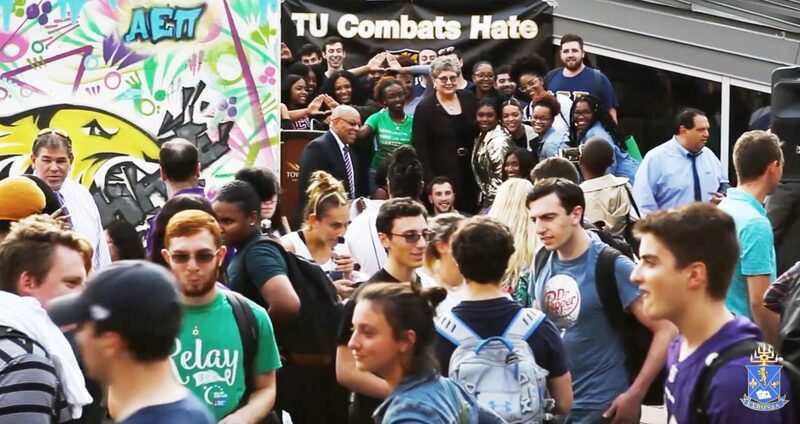 Following anti-Semitic attacks in April committed against two brothers of our fraternity, AEPi brothers at Towson University rallied with students, professors and members of the community last Thursday. The brothers of Alpha Epsilon Pi wholeheartedly agree with Brother Leckner. Ensuring action is taken after an event like this is the key to combating it. This message became the rally’s theme, empowering the hundreds of students in attendance. Notable speakers included Alison Pure Slovin (Midwest regional director of the Simon Wiesenthal Center), University President Kim Schatzel and Rev. Mitchell Johnson (pastor and an advisory council member to the Wiesenthal Center). “If anyone on this campus does not feel supported, it’s time we make a change,” said Kim Schatzel, president of the university, receiving snaps from brothers and applause from the crowd. A mural was painted by our good friends at Artists 4 Israel, showcasing the Towson Tiger biting into a crumbling illustration of “hate”. Alpha Epsilon Pi stands against all forms of hate. Support the efforts of AEPi and the brothers at Towson University by sharing this article. A special thanks to Towson Hillel, The Simon Wiesenthal Center and Artists 4 Israel. Quotes taken from the Baltimore Jewish Times.